On September 30, 2014, CMS published data records containing 4.4 million payments valued at nearly $3.7 billion in payments and transfers of value made to physicians and teaching hospitals in the last five months of Calendar Year 2013. This includes ownership or investment interests in applicable manufacturers and GPOs (group purchasing organizations) held by physicians or their immediate members, in addition to payments provided for research activities, gifts, speaking fees, meals, or travel. These and other data are available to peruse using the "Data Explorer" tool on the OpenPaymentsData.CMS.gov website. Unfortunately, I could not download the entire database because the number of records exceeds Excel's limit. Instead, I downloaded data for six specific pharma companies to perform my analysis. 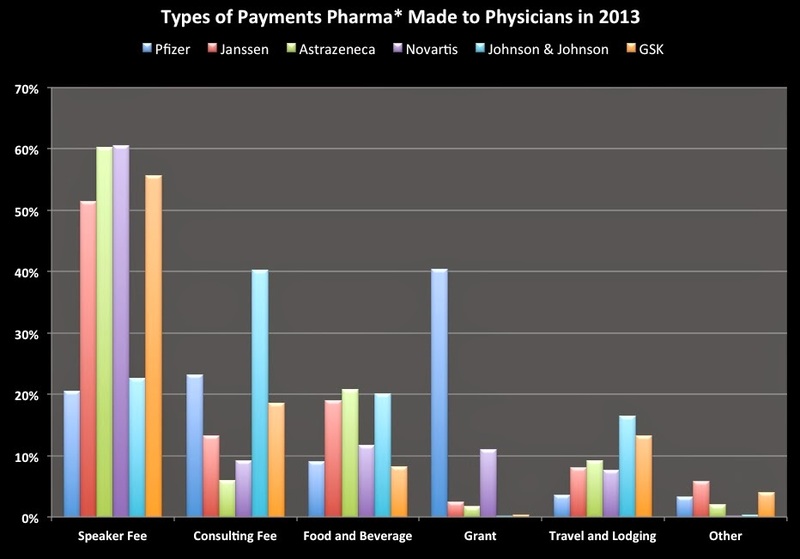 Although the result may not be representative of the entire drug industry, it does show how different companies dole out the dough to docs. The pie chart shown at the top of this post represents the average percent spent in several categories by these 6 companies. "Other" includes education, honoraria, grants, and charitable contributions. Keep in mind that these are payments made in the last 5 months of 2013. These six companies accounted for $62.7 million in spending. 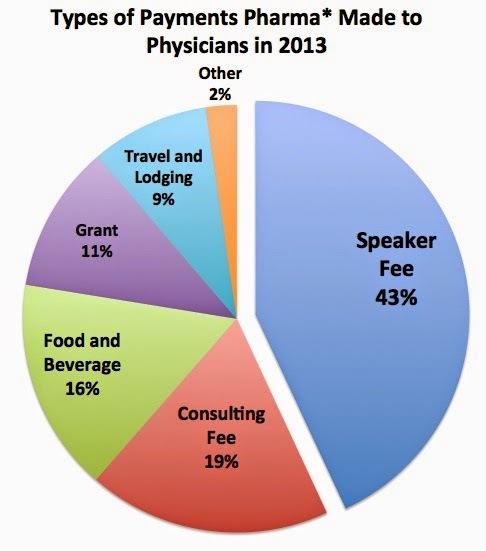 This is just a small slice of the $3.7 billion reported by CMS. John, hats off to you for using the CMS website for your research!